WFSC has a 3 year Stream Restoration Plan for the Westfork of the Kickapoo. It was approved by the WFSC Board May 2018. The WFSC will commit $5000.00 each year of 3 years. The WFSC seeks donations to match this $5000 each year. Total cost for this 3 year project is $30,000. The plan is designed to allow the water and the club grounds to better handle the floods. We have had multiple 100, 300 and 500 year floods in the last 10 years. 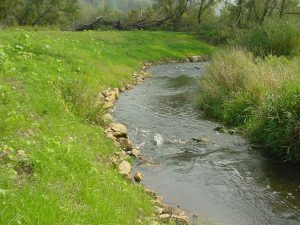 This stream plan sculpts the land to allow the river to ride over the land without great damage. It will also improve the fishery. The 3 year plan will be carried out as funding, weather and permit work days allow. If we can not finish it in 3 years we will apply for an extension. Your donation towards this project is greatly appreciated. The WFSC has a separate Stream Restoration Fund and all monies donated for stream restoration will go to that account and only that account. 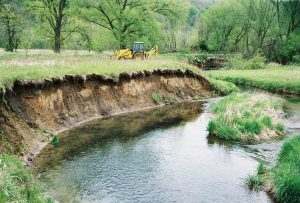 Other good sources regarding the connections of stream restoration and Economic Impact Summary of Trout Angling in the Driftless Area and Fishing please see the TU Dare.